What Are Systematic Reviews: a video from the Cochrane Consumers and Communication Group. A meta-analysis uses statistical methods to combine information from a number of separate but similar studies and derive conclusions on that subject. 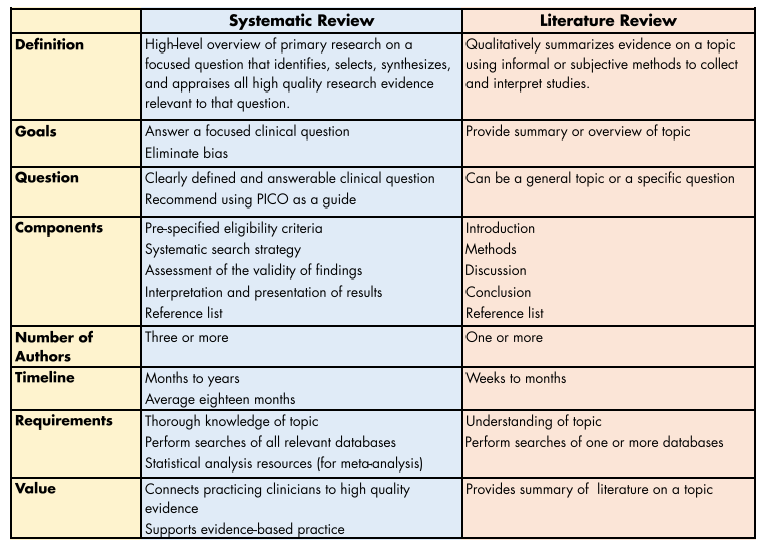 A literature review intends to provide an overview of a subject. It does not include a systematic search of the literature or a description of the methods used in the review and is sometimes based on author experience. These reviews may be subject to bias. Work with a librarian on your next systematic review! Request an appointment to meet with us. Need assistance with library resources or services? Ask a librarian! We are available via chat, email, phone or texting during staffed hours. Rapid review - A rapid review is like an accelerated systematic review. It may take 2-4 months to complete. While it assesses the evidence, it lacks the rigor of a full systematic review.